Being able to accurately measure the presence of gases is crucial to the success of any process. The latest monitoring technologies are particularly focused on hydrogen, oxygen, carbon monoxide and hydrogen cyanide. The presence of other gases is an important requirement in many process industries for both process optimisation and for safety. These measurements are difficult or costly to perform, however. Now instrumentation specialist Quantitech is launching a new technology from the USA that resolves the issues concerning hydrogen. Commenting on the market for hydrogen sensing, Quantitech sales director Dominic Duggan says: "Hydrogen monitoring does not take place in many applications because of the problems or costs associated with the available technologies, for example lack of specificity. However, the new sensors from H2scan resolve these issues offering significant advantages in process control and safety management." US company H2scan has developed inline, solid-state palladium-nickel based sensors that are highly selective to hydrogen, do not require oxygen to operate, and can detect hydrogen in concentrations from a few ppm to 100 per cent (Fig. 1). Hydrogen has the potential to be an important source of clean fuel in our energy-driven economy. The use of hydrogen is widespread in both traditional applications, such as petroleum refineries, and growing rapidly in newer sectors such as fuel cells and power generation. Based on recent market reports, global hydrogen consumption has grown from 21 million metric tons (MMT) in 2005 to more than 32 MMT 2007. Global hydrogen usage is expected to surpass 50 MMT by 2012 and is expected to exceed 79 MMT by 2016. Currently, over 90 per cent of all hydrogen produced is used in the petroleum refining industry, where continuous monitoring of hydrogen is highly desired to improve both the quality and yield of hydrocarbon-based fuels. Because of hydrogen's combustible and explosive properties, accurate leak detection is also important for safe hydrogen transport, storage, and use. In certain industrial applications - such as hydrogenating cooking oil and hydro-treating petroleum crude into heating oil, gasoline, and diesel and jet fuels - it is critical to quantify the absolute concentration (partial pressure) of hydrogen in process operations to ensure process safety and operational efficiency. A typical refinery application for an inline hydrogen sensor is to measure the total hydrogen content in a mixed gas matrix (a mixture of hydrocarbons, carbon dioxide, hydrogen and other gases) as a function of time. 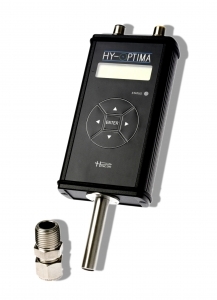 The H2scan inline process hydrogen sensor allows direct point-of-use analysis of hydrogen concentration from 50 per cent to 100 per centv/v. Hydrogen producers are also interested in accurate sensing as a key part of hydrogen management. For instance, within the pharmaceutical industry, multiphase hydrogenation reactions involving solid catalysts play a critical role. Accurate hydrogen monitoring is also needed in hydrotreating and in hydrogenation processes in hydrogen production facilities. Hydrogen sensors can now be applied to current and future gas- or liquid-filled pipelines, offering safety improvements with a hydrogen-specific sensor that can be wrapped around pipeline joints and valves to detect the first level of leakage, or additional sensors can be employed to quantify the hydrogen content of natural gas within the pipeline. The applications for hydrogen-specific sensors have increased markedly as a result of the new technology and because accurate hydrogen monitoring is a key component of several emerging areas of the hydrogen-driven energy economy. Chematur Engineering of Sweden has selected Servomex and channel partner OmniProcess to supply a complete gas analysis monitoring system to a new toluene di-isocyanate (TDI) plant currently under construction in Dahej, India. The 50000t/y plant is being built on behalf of Indian chemical manufacturer GNFC. The new system will help control the process and monitor the quality of output in the manufacturer of TDI, a key isocyanate used in the manufacture of polyurethane and used for a variety of applications including flexible foams used in furnishings and the motor industry. Servomex will supply a range of its world-leading gas analysers to fulfil the complex requirements of TDI monitoring, including 15 SERVOTOUGH SpectraExact (2500) process gas analysers, two SERVOPRO 4210 gas purity analysers, one SERVOTOUGH OxyExact (2200) paramagnetic oxygen analyser and three k1550 katharometer-based analysers. Designed, manufactured and tested in configurations specific to the required measurement and background stream, the SERVOTOUGH SpectraExact is a photometric process analyser that offers single or dual component gas analysis to suit virtually any process, combustion or emissions gas analysis application, making it ideal for several TDI measurement processes including monitoring the off-gases from mixing chlorine with carbon monoxide to make phosgene and monitoring for both carbon monoxide and chlorine in phosgene. Control of residual oxygen concentration in pure carbon monoxide in the range 0-0.5 per cent will be made by the SERVOTOUGH OxyExact 2200, with a measurement precision made possible by Servomex's paramagnetic cell technology that enables an oxygen measurement that is totally unaffected by other gases in the monitor stream. The SERVOPRO 4210 gas purity analysers will monitor the level of specific impurities in pure hydrogen and pure carbon monoxide respectively, with one unit monitoring a pure hydrogen stream for trace carbon monoxide and other 4210-based system monitoring for the presence of methane in carbon monoxide. 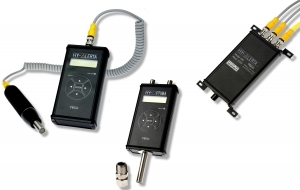 Finally three k1550 katharometer analysers will monitor the hydrogen purity and the quality of carbon monoxide supply to the TDI process by checking the level of residual hydrogen remains between 0 and 1 per cent. Each Servomex gas analyser will be installed in its own cubicle with an appropriate sampling system and all necessary pipework, ready for connection in the appropriate area of the plant. In addition to Servomex's experience in offering reliable and accurate process analysers suitable for different and tough applications, Chematur selected Servomex on proven experience in the design and build of TDI analyser systems, as well as the ability to provide industry-best levels of service and support to the project. "TDI production is by its nature a complex process, so Servomex is delighted to have been selected once again by Chematur to supply this gas analyser system through OmniProcess AB," says Servomex md Chris Cottrell. "We have been chosen not simply on the acknowledged quality of our instruments, but in our ability to deliver a complete gas analysis solution that ranges from the design and build of the system to providing 'local-for-local' service and support in India." The TDI plant is scheduled for completion in September 2010. Three Honeycat air pollution control systems designed for the abatement of hydrogen cyanide gas from the reduction process of a carbon fibre manufacturing plant have been installed by UK air pollution control specialist AirProtekt. The Honeycat systems comprise a compact skid-mounted oxidiser designed to comply with the environmental emission limits demanded by the carbon fibre plant's local regulatory authorities and minimise on-site installation time. "The textile processing project required an air pollution control system that was very much proven on this process. The solution AirProtekt opted to use has proved effective for over 30 years in various applications worldwide. The air pollution control system featured gas tight sealing to prevent localised emissions of toxic hydrogen cyanide gas. Mindful of the local people living in nearby residential properties the system needed to be both highly effective at capturing and treating the hydrogen cyanide emissions as well as being very quiet in operation to avoid noise pollution," explained Trevor Lawton, AirProtekt's md. A very low maintenance solution, the electrically pre-heated abatement system is designed to be capable of running at low catalyst operating temperatures which helps to minimise running costs, thermal stress and ensures a long operating life.